Well I did it again, I made another plaid pattern. Introducing the Chunky Plaid Beanie. Honestly I knew I wanted to make matching beanies for my husband and myself. I wanted a his and her plaid beanie set. This Chunky Plaid Beanie is designed to match the Chunky Plaid Bun Beanie I released two days before this one. I really hope you like the set. My husband and I just love these beanies. I chose to use the Red Heart Super Saver Chunky for this beanie because I really wanted to use a light gray with the plaid. Other options for a chunky yarn would be Red Heart With Love Chunky and Red Heart Soft Essentials. Do you love to crochet? Check out all my free crochet patterns or some of my favorites below. In order to make the beanie appear plaid you need to pick the right colors. The original plaid design is created when you weave with two different color using vertical and horizontal stripes. The result is that you appear to have three colors, the first two you started with and the third where the two different colors cross each other. Well that is in weaving, in crochet we need to use three colors, two colors and a third color that is the perfect blend of the other two. This is really simpler then it sounds. Just pick two shades of one color and add either black or white to those colors. You can also pick three shades of one color, but I find it is really hard to find a yarn with three perfect variations of one color. Experiment with different color combinations for you Chunky Plaid Beanie! 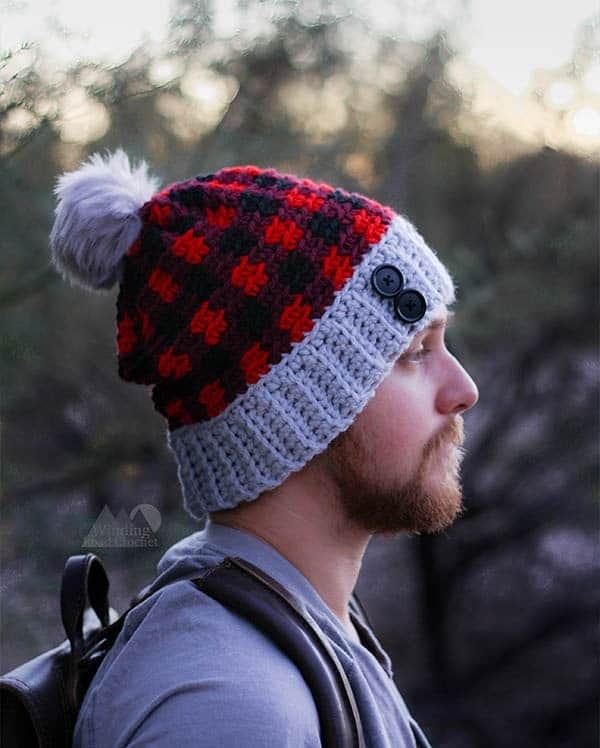 Love the Chunky Plaid Bun Beanie pattern? Don’t forget to Pin it for later! If you are a fan of Plaid Check out my Free Printable Plaid Gift Tags! You can get them by filling out the form below. While you are at it check the little box to get my newsletter and be the first to know when I release new patterns and printables. Fasten off, leaving a 8 inch tail. Use this tail to sew Row 1 to Row 56. Be careful not to twist the brim. Adult size you will only work 48 rows for the brim. Pre-teen size you will only work 44 rows for the brim. Child size you will only work 40 rows for the brim. I will refer to the 3 plaid colors as light, medium, and dark. You will be working all in one direction without turning for the Body of the hat. After Row 1, all stitches will be worked in the back loop only. Fasten off, leaving one 15 inch tail and weave in all your ends except that one long tail. Adult size, work all 16 rows plus foundation row. Pre-teen size, work Row 1-14 plus foundation row. Child size, work Rows 1-12 plus foundation row. Turn your hat so that it is inside out. Using the long tail and a yarn needle sew a star into the opening of the hat. Look at the diagram below for clarification. The Black circle is the top of your hat. You want to sew through the hat at the points of the star. Then pull the tail tight. You will end up with a Star shape with five points. Run your tail end through all those points like the diagram shown below. Pull the yarn tight and fasten it off. This method will leave you will a star shape gather on the top of your beanie. You can see this in the photo below. I think this looks good with or without a Pom pom. Add a pom pom if you desire and your Chunky Plaid Beanie is done! I really hope you enjoy your new chunky plaid beanie. Let me know in the comments below what you thought of the pattern. Are you going to make a Chunky Plaid Beanie for someone you love? I would really like to see your finished beanie, take a picture and share it with me on any social media! Just tag me @windingroadcrochet, #windingroadcrochet, or #ourcrochetjourney. Join my Facebook Group and share your creation with the community at Our Crochet Journey Facebook Group! I am so happy you have find my site. Before you leave I wanted to share with you a few more of my favorite patterns below. Written pattern, tutorials, graphs and pdfs for the Chunky Plaid Beanie are copyright 2018 Windingroadcrochet.com. Please do not reprint or repost this content as your own, but please feel free to share this link with others. You can find more information on sharing my work with others in the Terms and Conditions Page. I am carrying the two colors I am working with, but the third color I am not carrying though out the project. Carrying the yarn throughout the project reduces its stretchiness. I made three of these in the last few days, using the grey band and red, dk red, and black. I did add a highlight stripe of yellow to make them “team” hats – KC Chiefs. Fun look and unique, too! It does take some fiddling and even ripping out rows because of the “stretch” factor. The worst were the two I made using a grey Lion Brand Homespun (?) as it’s thick and really fuzzy so it set the stage for a much looser stitch with the Red Heart yarn. If I ever do these again, I might make the plaid part separate and then sew to a fuzzy brim! That would be beautiful. I did have issues with the stretch as well. I ended up make the brim larger to help with the stretch factor.